Happy Monday, friends! I hope everyone had a wonderful weekend. We had our first baby shower this weekend, and it was so much fun! The host put together the cutest elephant theme. I’m planning on sharing more about it later, but it’s crazy to think I’m in my third trimester now and getting so close to meeting our little one! The next two months are going to be pretty busy but definitely fun! Anyways, now that I’m in the third trimester, it’s about time I finish some of the stories from my first trimester! I told y’all a few weeks ago about how I told Chris about baby, so today I wanted to share a little about how I told our parents. 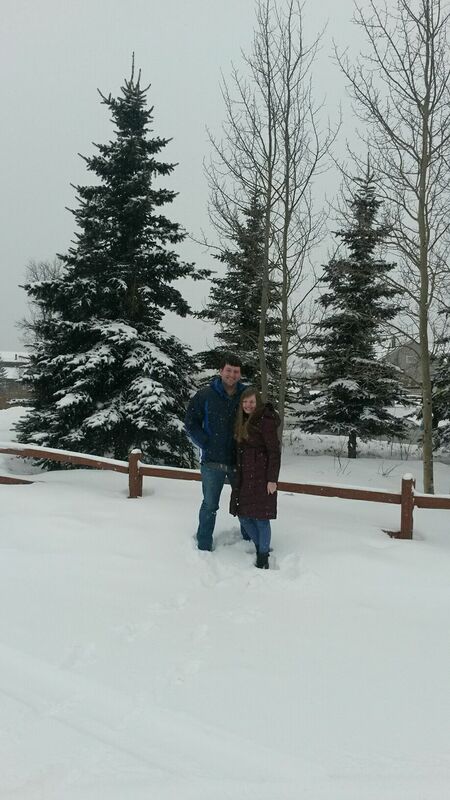 Five weeks pregnant in Breckenridge! Chris and I had pretty differing opinions about when to tell our parents. He, thinking like a physician, wanted to wait until 12 weeks when it was “safer” to tell people. I wanted to tell just our parents as soon as possible. Also, Chris and I were going to Colorado with my in-laws for a week just a week after we found out I’m pregnant, and I really didn’t want to try to hid it from them, especially since I had no idea how I would feel. I’m a pretty private person, but I do try to stay open with our families. They knew that my OB had given us the green light to try to conceive starting in January, but I also warned them we had no idea what this journey would look like after my surgery. We decided to tell my parents when we were dropping off Skyler, who was staying with them while we were in Colorado. I told Mom I had a present for them as a thank you for them keeping Skyler. Mom, of course, said “but we haven’t even done it yet!” I had gotten her a onesie that said “I love my baba” on it, which is the Russian name for grandma. It took her a little while to get it because she really just didn’t expect me to have any news! She first thought I had gotten her an outfit to put on Skyler! Finally, I said “Mom, I’m pregnant!” and it all clicked into place. She told me later she hadn’t even seen the writing on the onesie because she was so confused. Needless to say, both of my parents were super excited, and we celebrated in the traditional Russian way—with a toast! (don’t worry, I toasted with water). I’m not sharing the video because it’s in Russian, but there was definitely a lot of joy. My mother-in-law had the opposite reaction. Somehow, she had decided I was pregnant all on her own and was just waiting for us to tell them (and had even thought we had visited them two weeks prior because we wanted to tell them. Nope, we just wanted to see them! Haha. Funny enough, I was pregnant by then, but we didn’t know yet!). To tell my in-laws, I had purchased a wooden sign on Etsy that says “the best parents get promoted to grandparents.” Sadly, it didn’t come in on time, so I ended up printing out a piece of paper that showed the gift and told my in-laws when we met up to drive to Colorado I had found something that made me think of them! Even though my mother-in-law was already suspecting the news, they were still super excited about the news of their first grandchild! So sweet! I'm sure everyone is just so excited!! So funny the different reactions. How fun! I loved hearing about everyone's different reactions. We did the same thing with this onsies and my father in-law got it as soon as he saw it and it took my mother in-law a few seconds to pick up on what was happening. I can't believe you are in your third trimester either. Your shower sounds like it was such a fun time! That's too funny that both parents had totally different reactions! I love hearing around reveals! And I can't believe you're already in your third trimester!! I feel like time has flown! (Although maybe you feel differently, lol.) Glad your first shower was a success!! I love how you told both of them! Super cute! Funny that your MIL already just knew! That is so cute!!! Such an exciting time!! Thank you so much, Maddie! It's so fun to look back on those first few weeks of pregnancy! Aww I love that your mom was sort of confused at first...that makes it even more fun when she finally figured it out! Aww, telling family is SUCH a fun part of sharing pregnancy news! I love this! For my parents we made a sign that said "grandparents" and had pictures of all their grandkids on it (our kiddo is their 8th grandkid). So it was a bunch of black and white photos of all the grandkids and then an ultrasound photo at the end. It took my mom a minute to see it because she initially thought it was a picture of Oreo (since he's black and white and we obviously treat him like a child), ha! Awww I love your mom's reaction. That's hilarious that she thought it was an outfit for Skyler. Too funny!!! I love how you got different gifts for each set of parents that fit them! My mom was totally suspecting as well by some of the things that I said, but I really wasn't meaning it like that at all! I also love that y'all got to tell them both at the same time! I know that I wouldn't have been able to hold it in until 12 weeks!